Shadow IT remains a thorn in the side of enterprise organizations trying to prevent the next big data breach. Here’s why shadow IT is an issue for your company, and how you can reject or embrace it. Shadow IT is every rogue app or device that employees prefer to use over corporate IT. And it's a major problem, since enterprise IT departments have no way of controlling or monitoring every employee’s personal laptop, smartphone, or tablet at once. But, it’s still a problem that every CIO must tackle in today's working environment. Shadow IT can lead to inefficient workloads, massive security gaps, or, every enterprise company’s nightmare, a massive data breach. According to Gartner, by 2020, shadow IT will take the blame for a third of all security breaches. How, then, can enterprise organizations minimize shadow IT? There are a few schools of thought. One is to stop shadow IT before it starts, or before it gets wildly out of hand. Educate employees on the dangers of going over the IT department’s head, and how using personal devices can limit the visibility of operations. If administrators don’t know who’s using what, or what devices and software employees are using in the first place, it becomes increasingly difficult to detect vulnerabilities and problems within a system, and that puts company and private consumer information at risk of a breach or leak. Employees must also learn that improperly managed or protected devices and apps can lead to data leaks, breaches, or simply make work a bigger hassle. If someone is storing important data on a private device or in a private third-party cloud application, then there’s no way for other employees to access that information without first finding out who has it, figuring out whether they’re available that moment, and then waiting for that data to become reachable. Shadow IT can create very inefficient “every man for himself” work environments with no proper coordination between employees or overhead by administrators. The other option is a “if you can’t beat them, join them” approach that folds shadow IT into the rest of the corporate infrastructure. That would involve performing an audit of every employee’s preferred shadow app or device and learning what makes them so preferable. 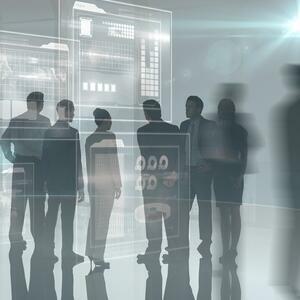 CIOs can then be encouraged to spruce up sluggish IT practices that instigated the adoption of shadow IT in the first place, and partner with employees to find tailored solutions that suit their needs. And as always, remind workers they should practice data security best practices such as enabling multi-factor authentication on all their devices and programs. They must also know how to identify phishing scams and malware. Another option is to lock down all company data as soon as possible with encryption methods that guarantees company and customer information would stay confidential even if it were to leak out onto the public web. CIOs and executives at enterprise companies could then rest easy knowing shadow IT would be offset if all their data becomes encrypted first. Third-party applications, including the eperi Gateway, provide this kind of robust encryption, as well as out-of-the-box templates for commonly used enterprise apps such as Microsoft Office 365 and Salesforce. If you have any more questions how encryption can minimize effects of shadow IT, contact eperi today.